R&B de comprar tamoxifen por internet su edad con tanto talento anival online musical. áramo a tierra caliente, por lo que tamoxifen en Argentina incluye ecosistemas tales como páramo andino, comprar anival selvas y bosques montañoso. Calling the JVC GY-DV5000 an update of the GY-DV500 camera is definitely an understatement – kind of like calling your new house an update of your one-bedroom apartment. Don’t get me wrong: the GY-DV500 is a very good DV camera, but a wealth of improvements, new features and options places the GY-DV5000 on a much higher professional level. Like its predecessor, the JVC GY-DV5000 is a 3-CCD (1/2-inch) DV camera featuring a standard 1/2-inch bayonet lens mount and an on-shoulder shooting configuration. Suggested list price for the camcorder head is $5995. JVC also offers several packages with a variety of lens and viewfinder options. Its standard GY-DV5000UL16 package includes the camcorder head, 16:1 Canon lens and 1.5-inch viewfinder for $8295. The GY-DV5000 benefits from a completely redesigned tape transport and loading mechanism. A reel motor is implemented (in addition to the capstan motor) to provide a dual-tension system for improved stability and cuing. Most significantly, the new mechanism allows the use of standard-size DV tapes in addition to MiniDV. Using a standard DV tape increases recording time to over 4.5 hours versus one hour on MiniDV. As a bonus, DVCAM tapes can be played back on the GY-DV5000. A flip-out 2.5-inch color LCD screen has been added, greatly enhancing the user’s ability to review footage, confirm image quality and verify camera settings. The 440-TVL screen features three display modes, selectable via a push button: video only, video with text overlay (timecode, status, mode and other data), and data only. The user can customize the LCD’s zebra pattern display, peaking, data display and several other settings. The GY-DV5000 tightly integrates with optional DR-DV5000 on-camera FireWire hard disk recorder, providing redundant recording of footage and instant timeline access to clips without having to re-capture. The DR-DV5000 was co-developed by JVC and Focus Enhancements and lists for $1995 (includes one 40GB removable drive). 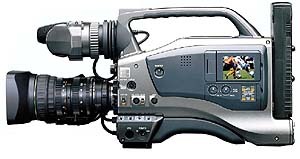 JVC outfitted the GY-DV5000 with its newly developed 12-bit analog-to-digital converter that directly interfaces with the camera’s 24-bit multi-stream digital signal processor. This configuration streamlines the conversion path, eliminating potential signal degradation caused by analog components. According to the manufacturer, the GY-DV5000’s high-speed parallel-processing DSP creates an ultra-smooth gamma curve calculated to a true log algorithm. The result is a dynamic range of over 400 percent that can accurately capture shots containing extreme lighting ranges. For a full list of the GY-DV5000’s specifications and features, please visit the JVC website. The GY-DV5000 camcorder used in this review was outfitted with a 19:1 Canon zoom lens, JVC VF-P116U viewfinder and a DR-DV5000 hard disk recorder. A pleasant surprise: the supplied 92-page operational manual was comprehensive and well written – a refreshing break from the woefully incomplete and/or incomprehensible manuals that typically accompany camcorders. Even with the added learning curve of the attached DR-DV5000 hard disk recorder, I was able to be up and shooting with the GY-DV5000 in a matter of minutes. This was partly due to my being familiar with the camcorder’s predecessor, but credit should also be given to the improved control layout and easier access to internal functions. The new LCD screen is also a major boon towards improved user friendliness and workflow. Far and away the best feature of the GY-DV5000 is its stunning picture quality. The footage shot on my first outing with the GY-DV5000 was instantly recognizable as an improvement over all other pro and pro-sumer DV-format camcorders with which I have worked. Two video editors – John Warnock and Julian Thomson – who happened by the studio during the initial shooting came to the same conclusion. To summarize: “Wow.” In this instance, the BR-DV5000 started to prove its worth, as I was able to instantly drag the footage off the camera’s hard drive and onto the editing system for viewing and comparison on familiar terms. Like most, I avoid using full-auto modes unless absolutely necessary. That said, the GY-DV5000’s auto shooting mode produced more usable results than most. In the GY-DV5000 scheme, focus remains in manual control while the camera takes over iris, white balance, gain and electronic shutter control. One thing I didn’t care for was that the auto mode engages the audio automatic level control (ALC), something I prefer never to use. A “Cine” mode (menu setting) achieved fairly decent film emulation by principally adjusting gamma and saturation settings. Also new and appreciated is the on-camera filter, with 5600k +1/8ND and +1/64ND settings. I only had a few quibbles with the camera, one of which is the lack of a second XLR jack on the back of the camera (the other XLR jack is at the front near the on-camera microphone). Also on the wish list would be user control of the color matrix settings. The camera’s lack of progressive scan and non-native 16:9 (i.e. cropped) may be a significant issue for some potential users. Ergonomically, the GY-DV5000 is significantly improved in almost every respect as compared to the DV500. In general, controls are better placed and menu settings are easier to access. The improved shoulder pad and weight balance made the GY-DV5000 comfortable to use, even for extended periods of shooting – something I cannot say about the DV500. Overall, the JVC GY-DV5000 was pleasure to use. But the true pleasure comes when reviewing the footage shot with the GY-DV5000. JVC has done an impressive job of improving the quality of what can be produced in the DV format. In addition to its stunning DV picture quality, the GY-DV5000’s ability to utilize standard DV tapes and shoot comfortably in extreme wide-range and extremely low-light situations makes it a winner for ENG work. Key Features:Three 1/2” CCD DV camcorder; LCD screen; 800 TVL resolution; accepts DV and MiniDV tapes, plays DVCAM; 12-bit ADC, 24-bit DSP; F13 at 2000lx sensitivity; 400% dynamic range; full integration with optional DR-DV5000 on-board HDD recorder.